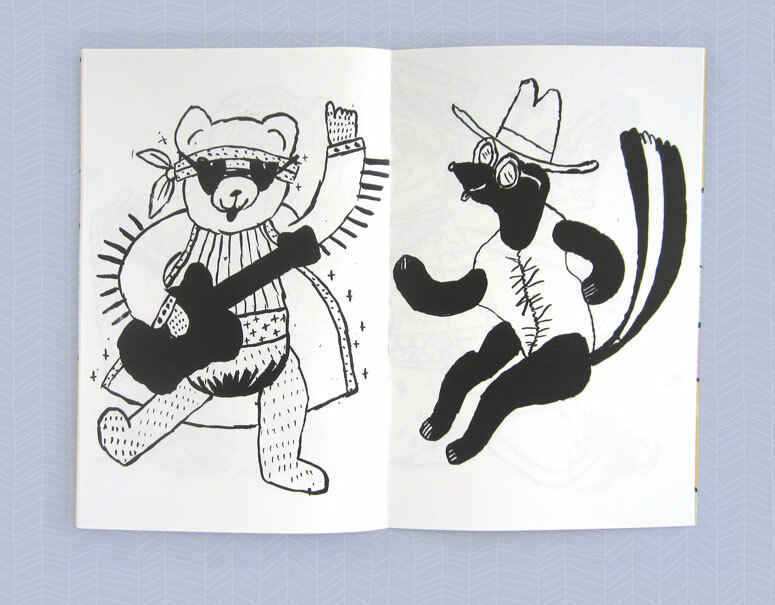 This coloring book series was published in 2015 & 16 by Matt Cassity. 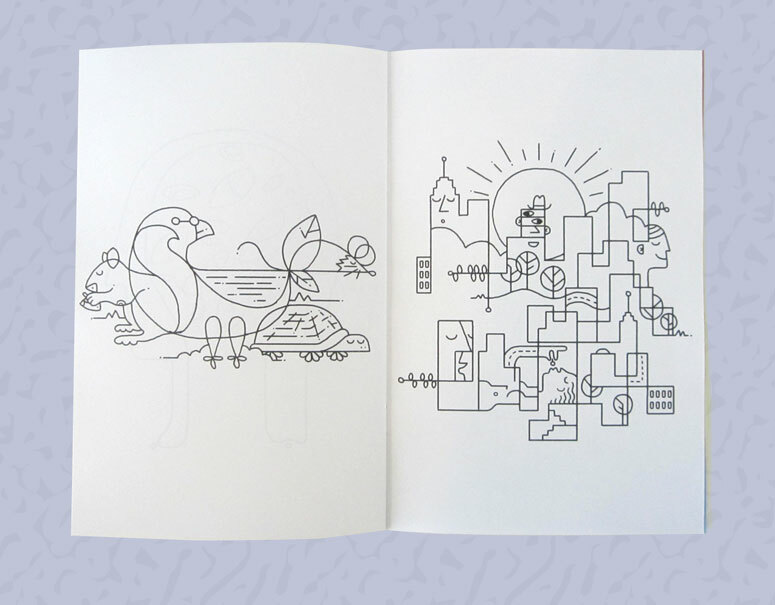 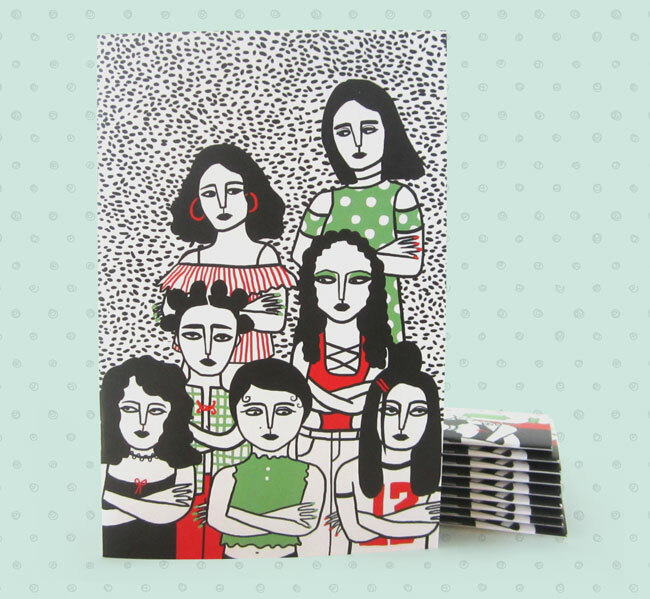 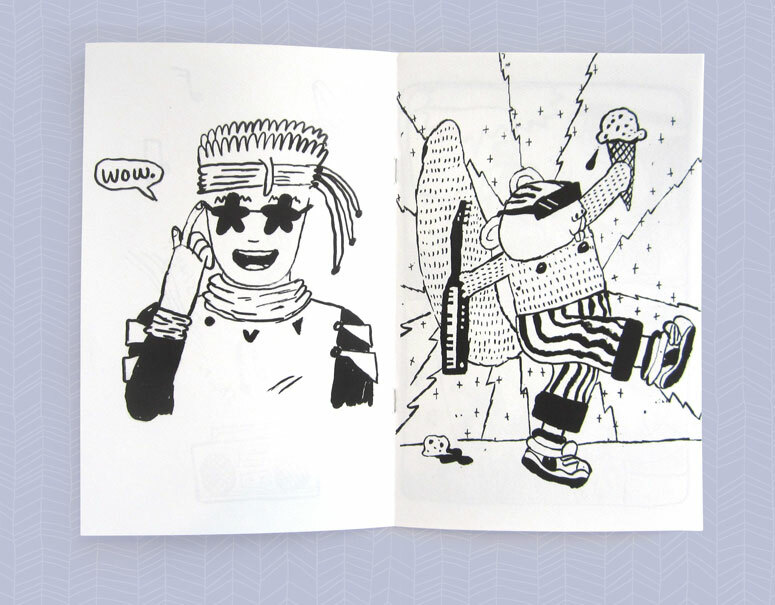 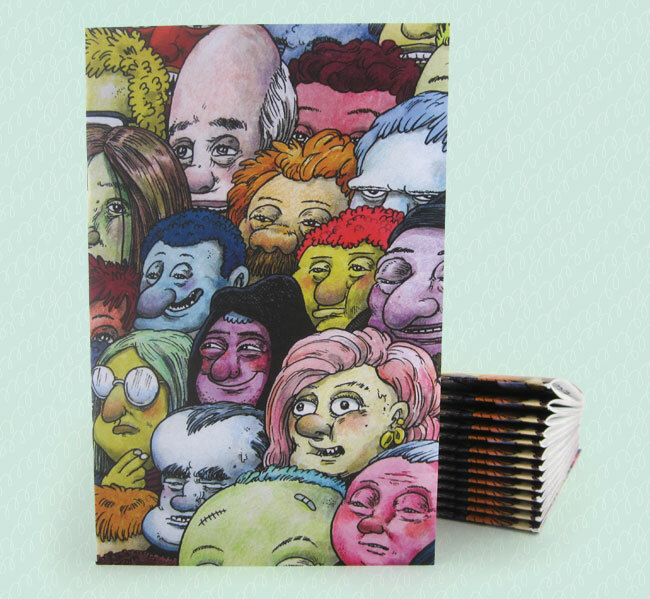 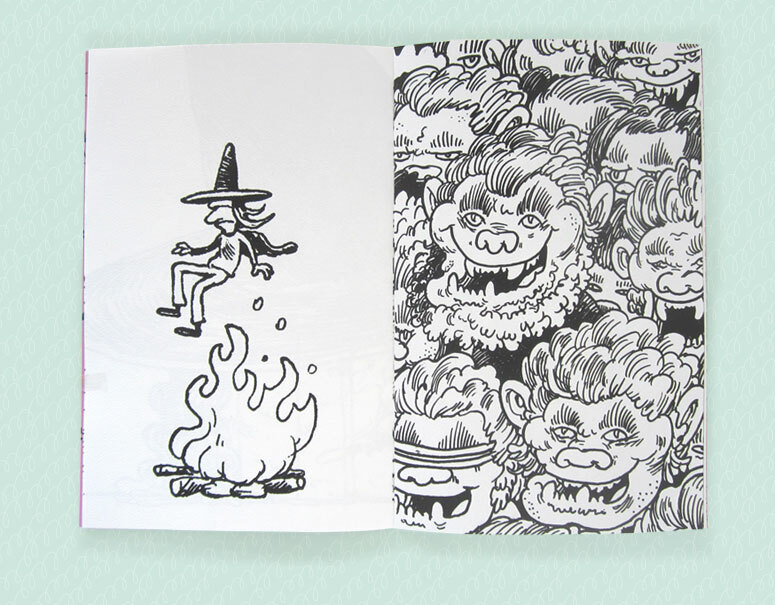 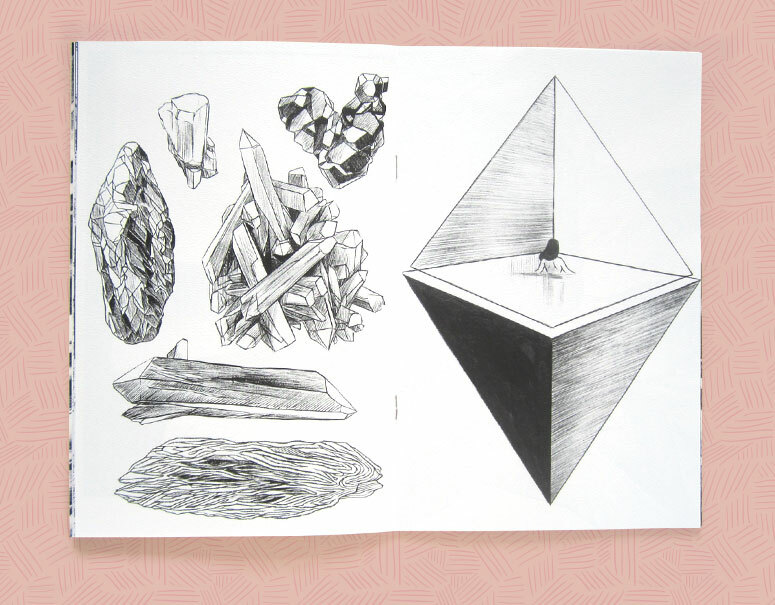 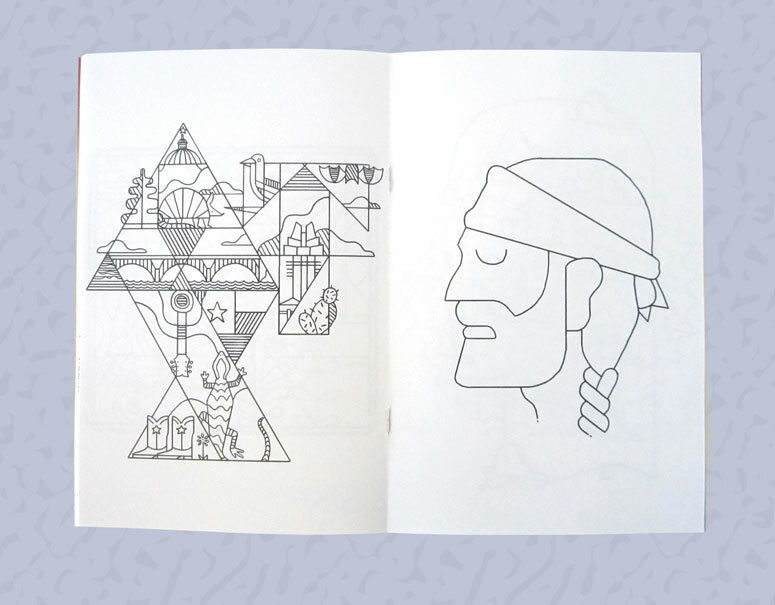 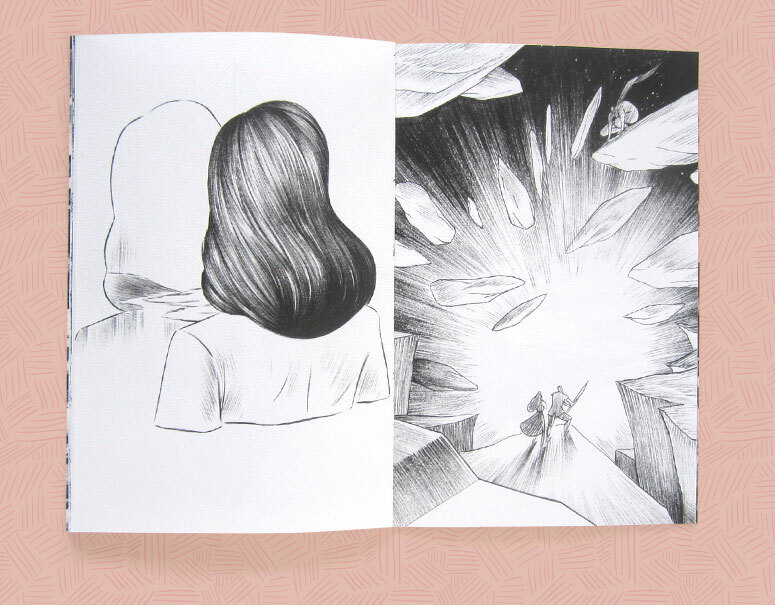 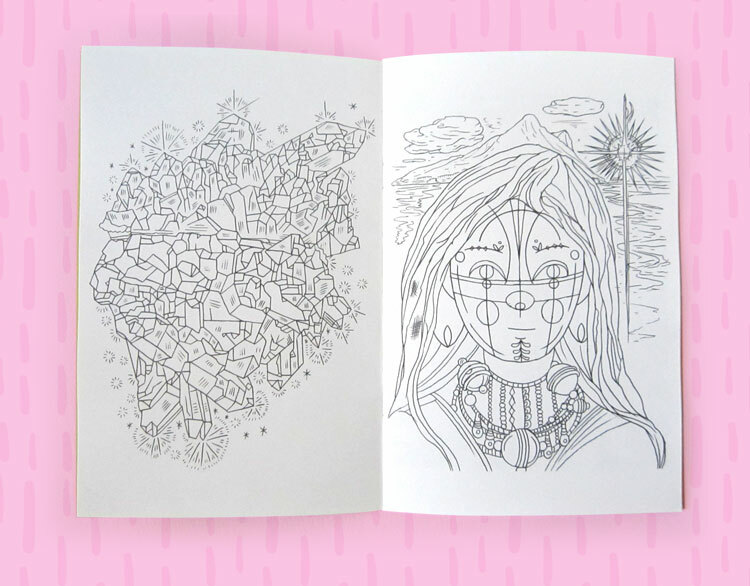 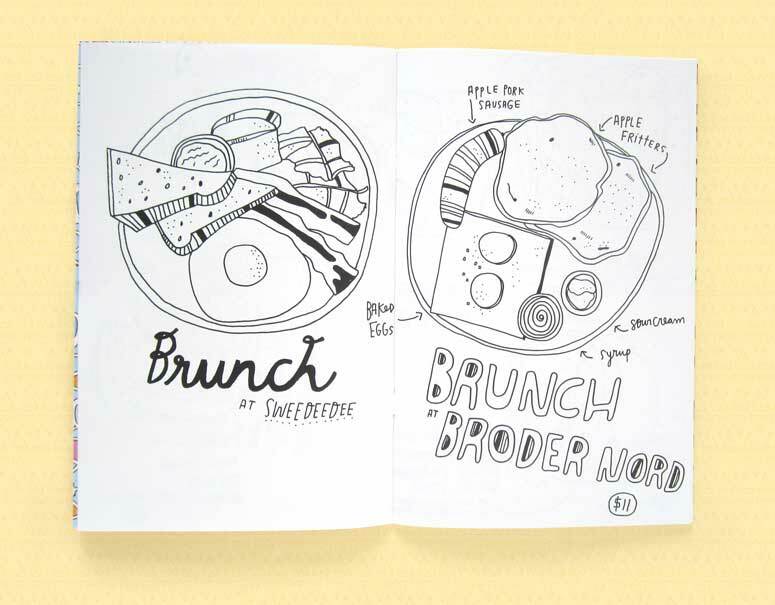 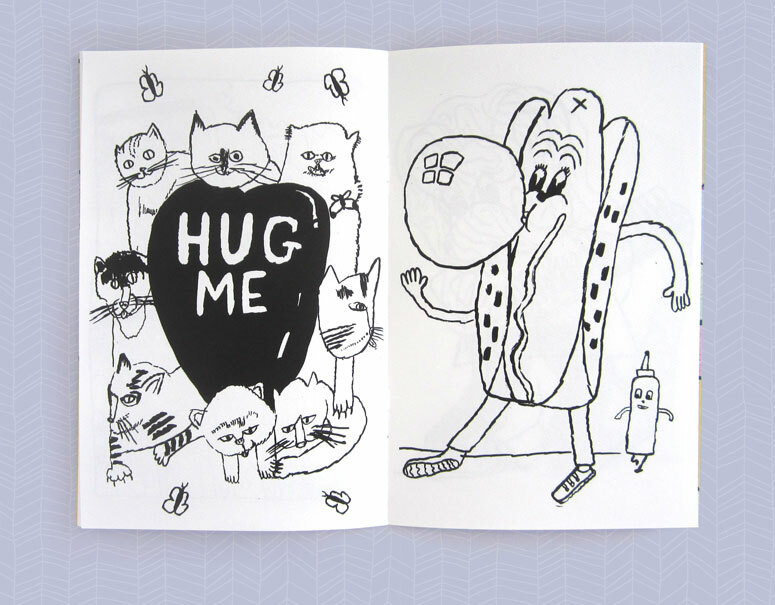 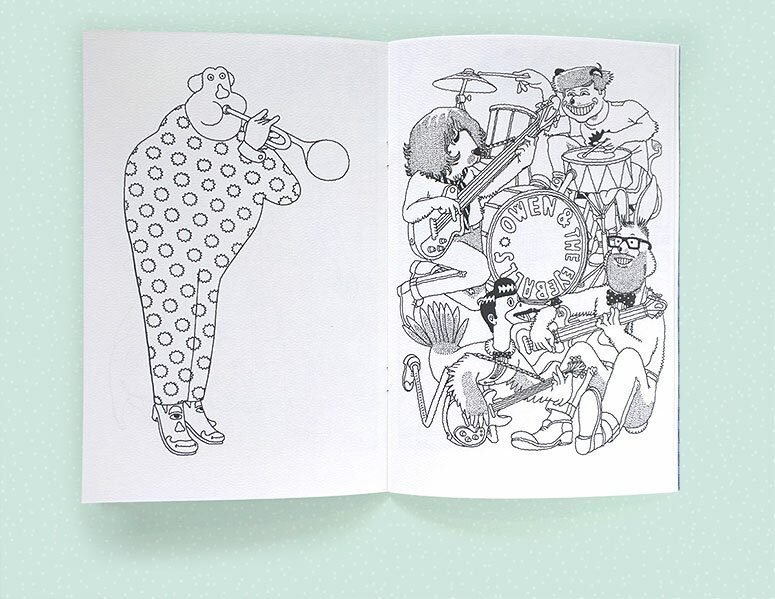 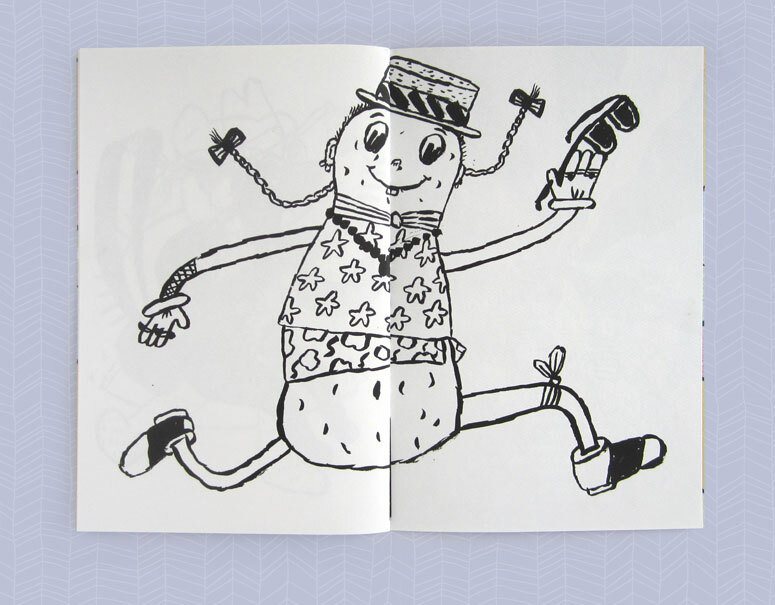 Each month, members received an artist-made, zine-format, 24 page coloring book. 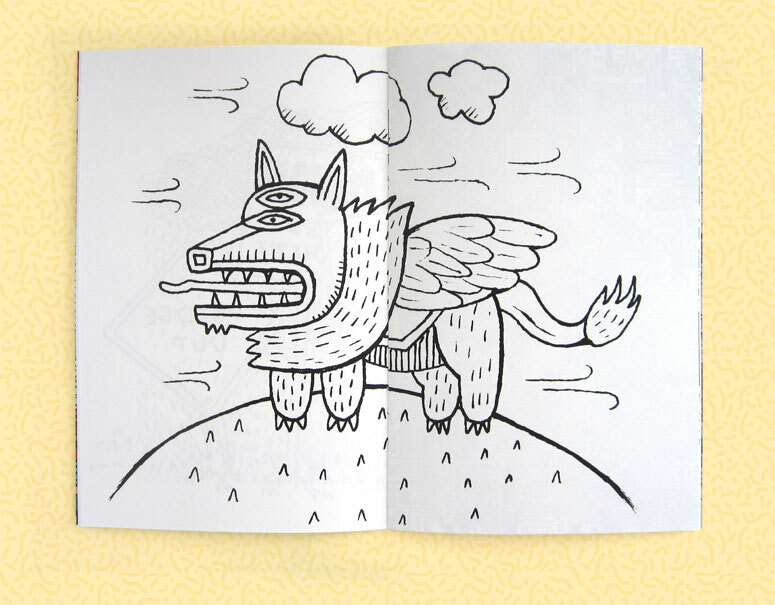 Ron Rege Jr makes thoughtful drawings and comics. 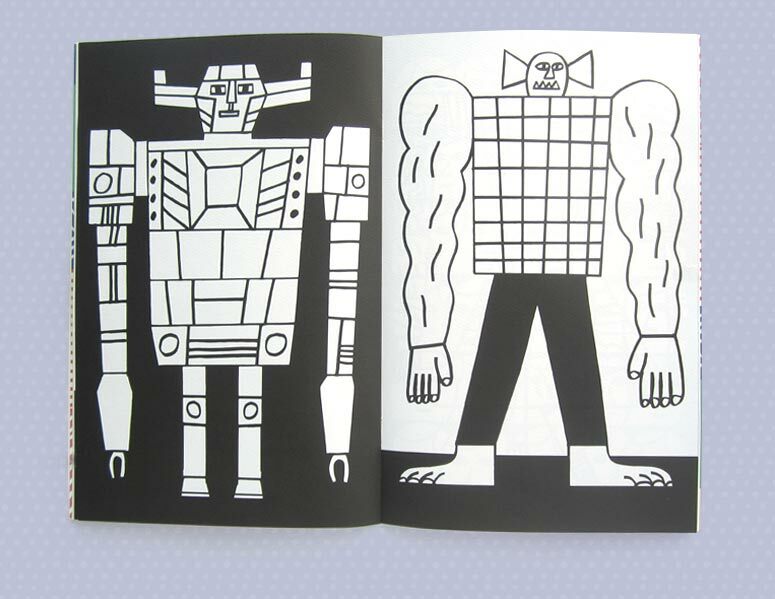 His distinct style weaves a world of his creation with obsessive patterning, inventive lettering, and open storytelling. 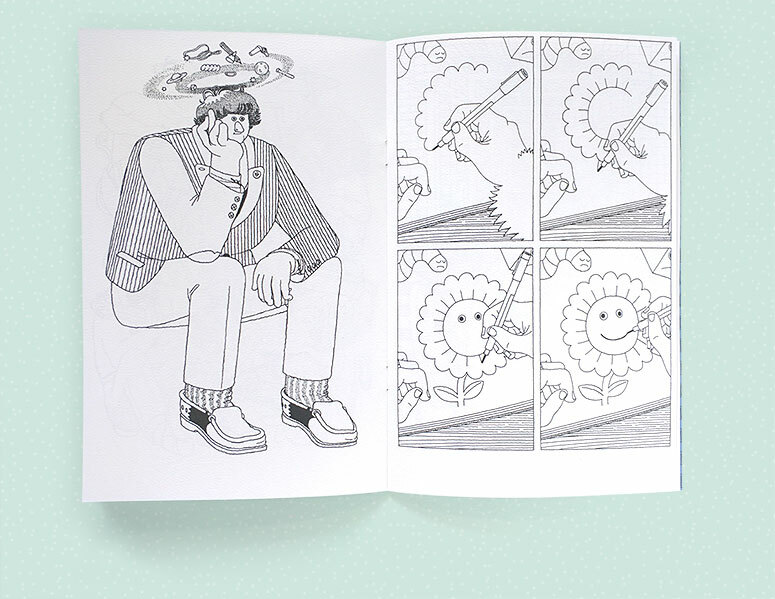 Subscribe to his monthly mini-comic. 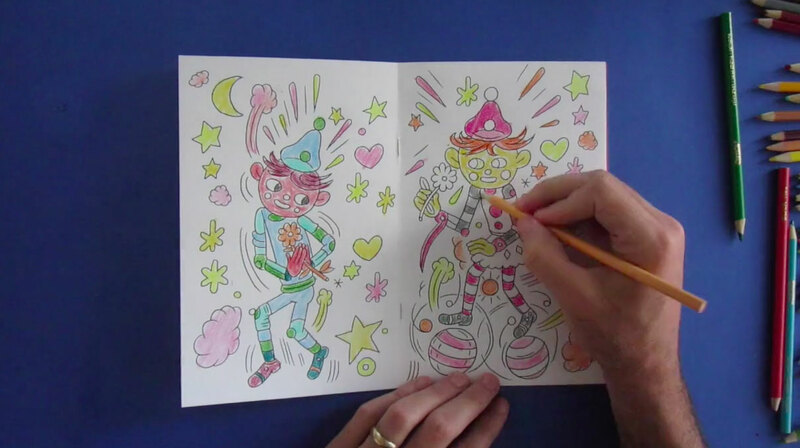 5 3/4 × 8 7/8 inches, 24 Black & White Coloring Pages, with a Heavyweight Full-Color Cover. 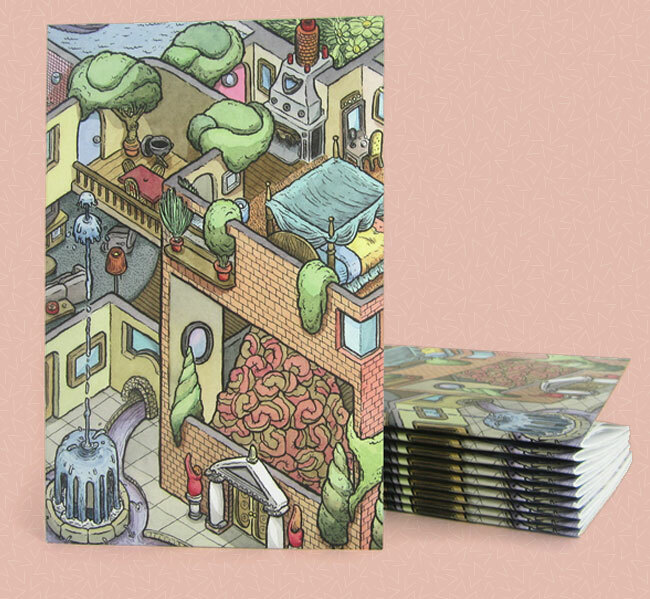 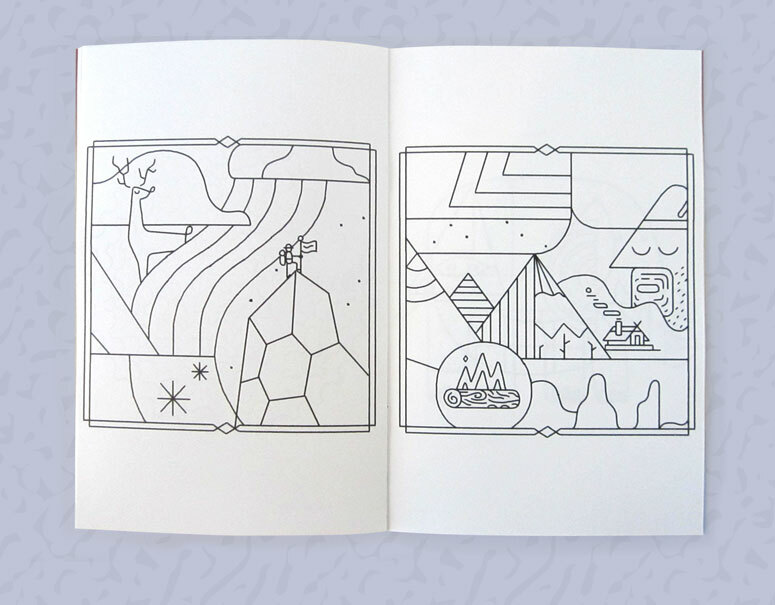 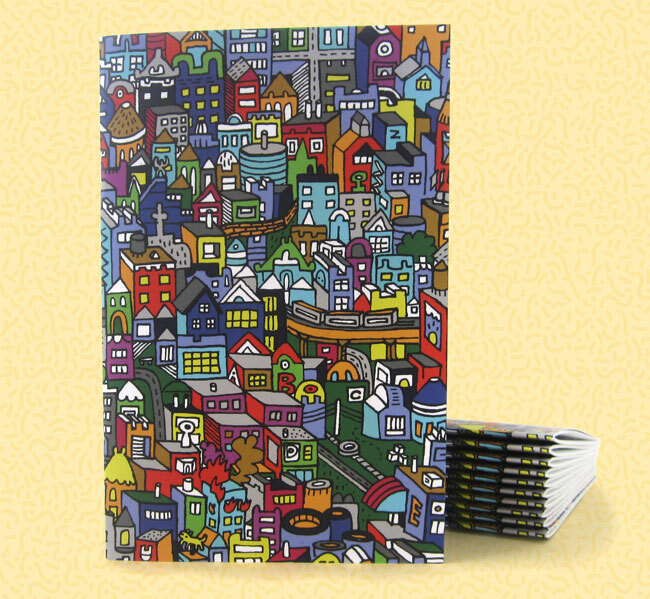 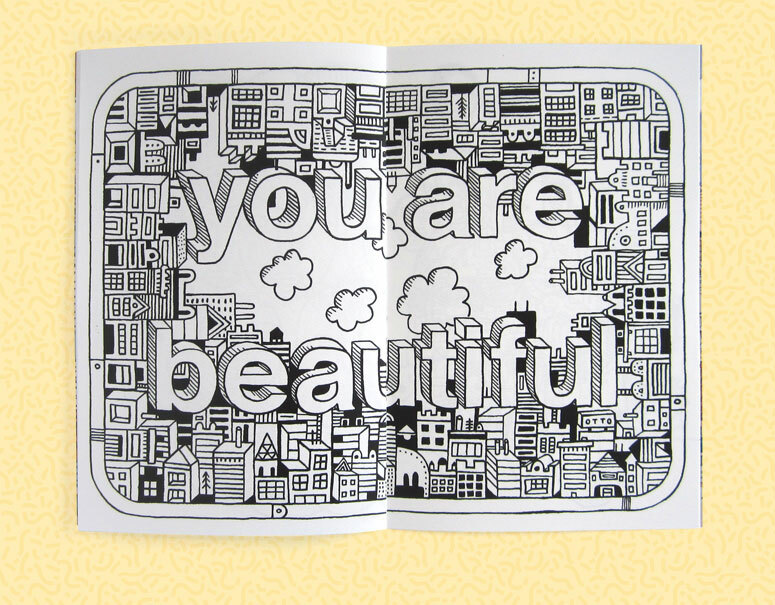 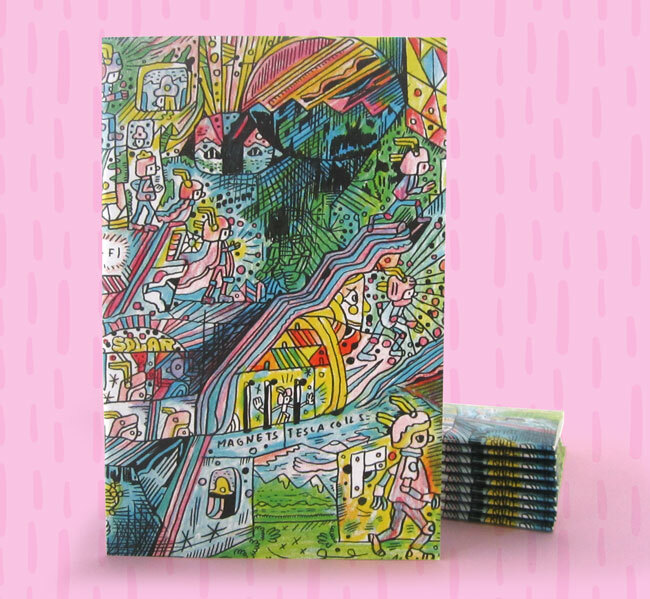 A different artist made a cool, off-the-wall, coloring book every month. 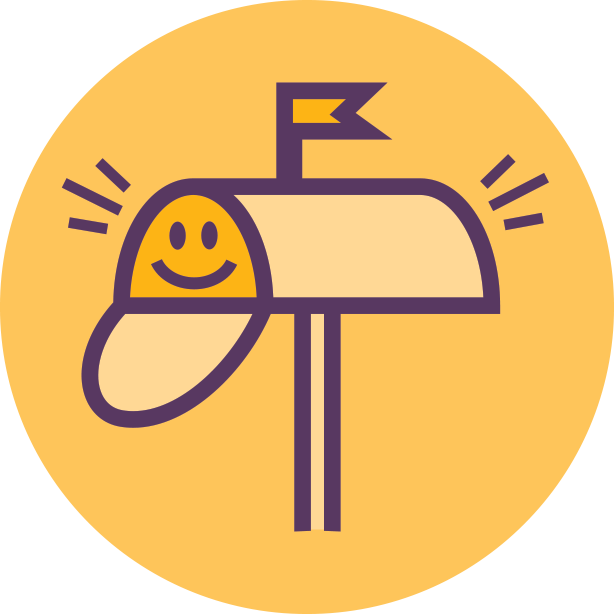 New subscriptions shipped immediately. 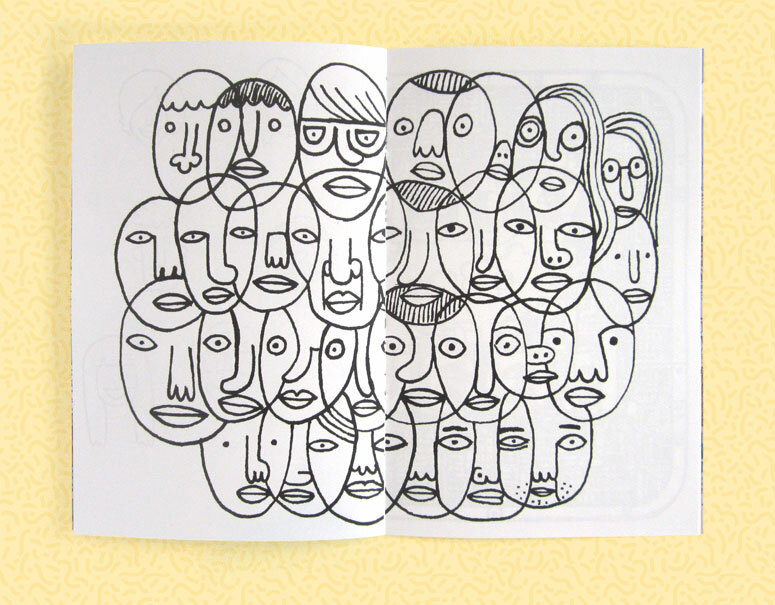 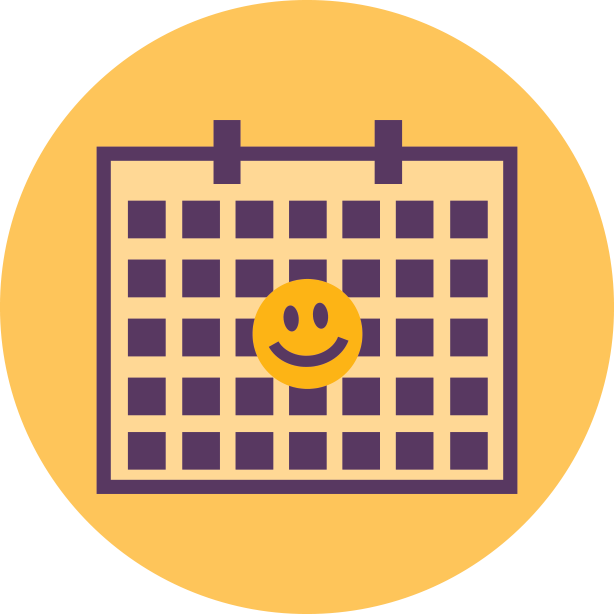 Issues were released the middle of each month. 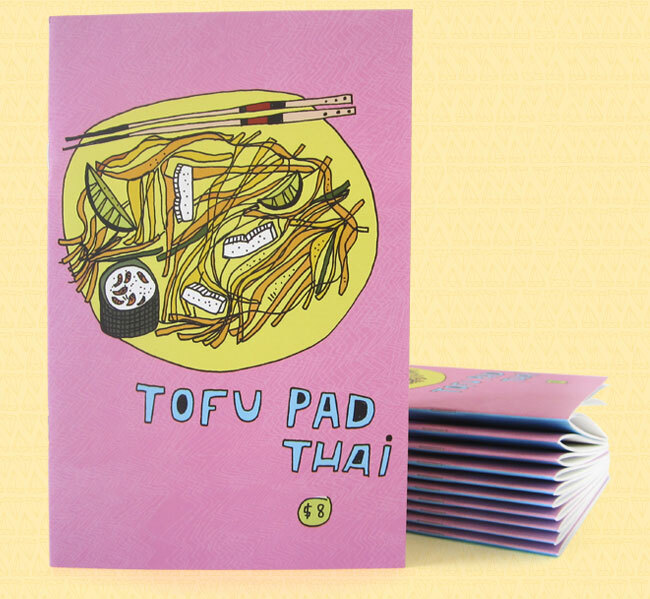 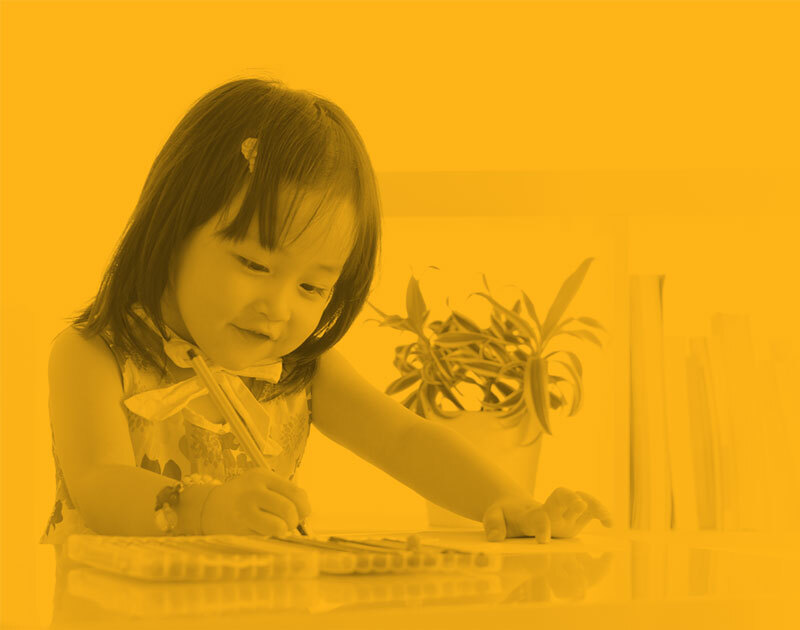 Addressed & delivered to your creative kiddo’s mailbox.   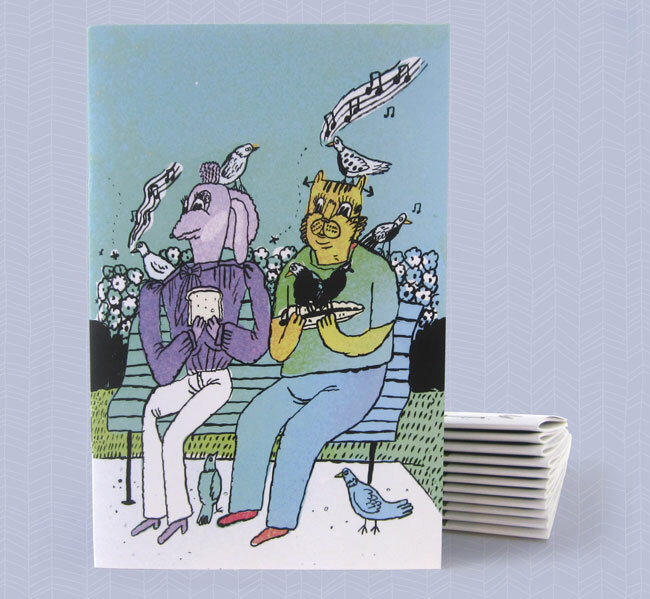 Alex Citrin is an illustrator and art director living in Queens “the world’s borough” NYC with her about-to-be husband and their always-has-been cat. 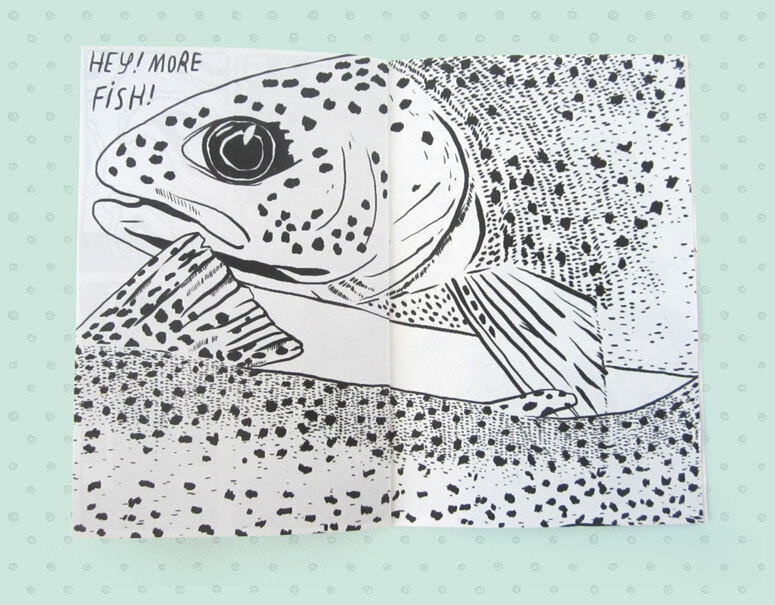 Usually Alex is drawing for magazines and newspapers, some you may have even heard of.  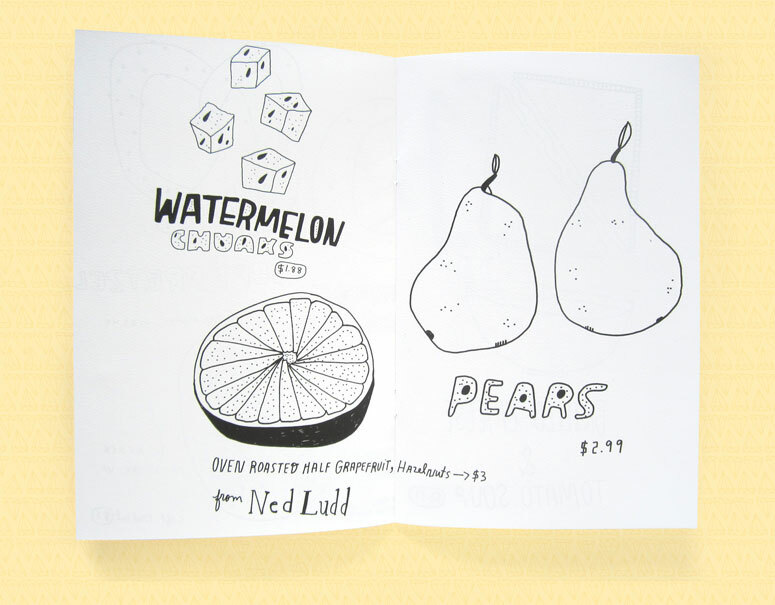 Brian Gossett is a Maker of Things (drawings, videos, podcasts, and more) in Austin, Texas. 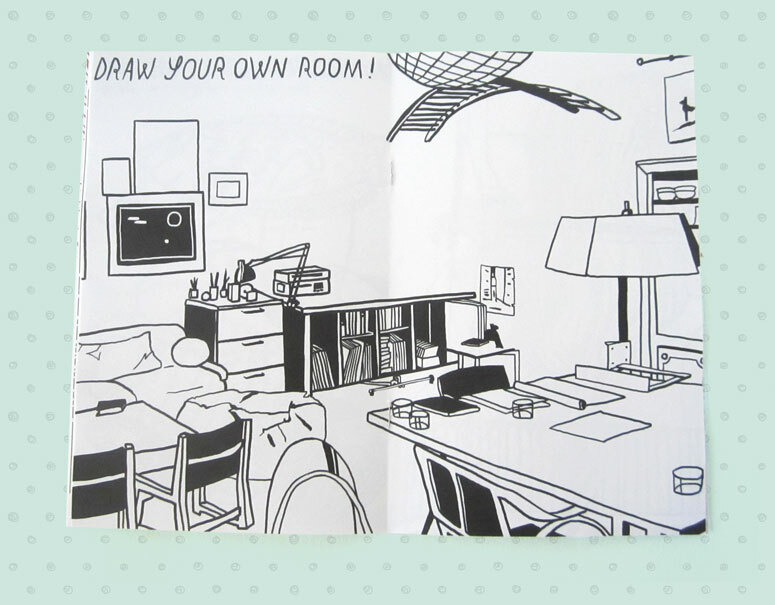 When he was a kid he loved to draw pictures from his favorite comic books and used his action figures as models for drawings! 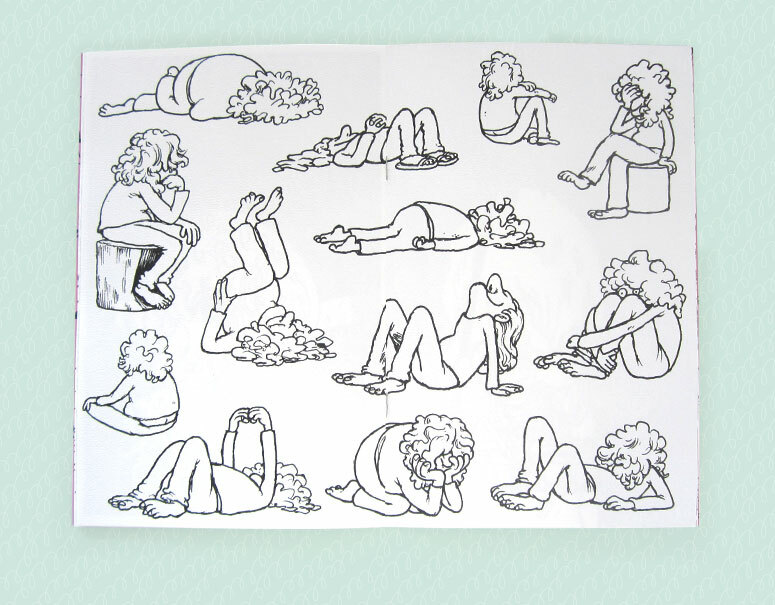 Esther Pearl Watson teaches people how to be illustrators and artists, makes comic books about other people’s lives, and paintings about her own life. 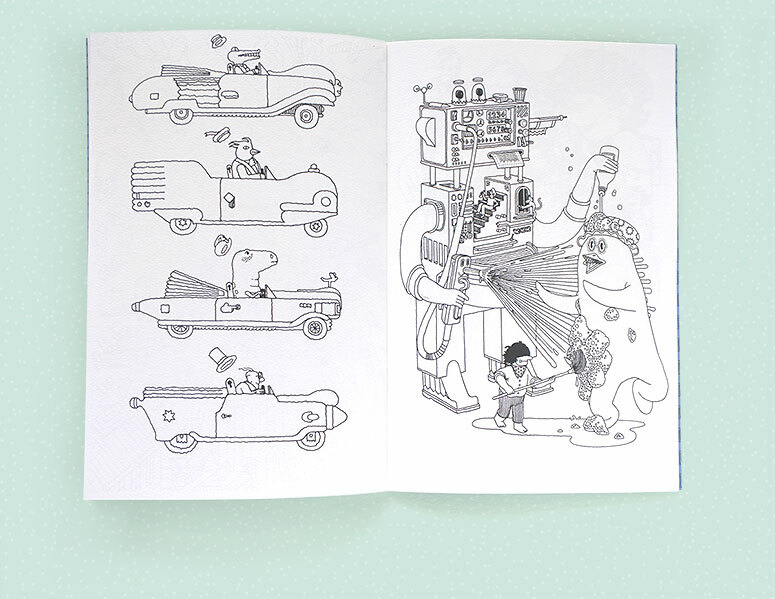 Jürg Lindenberger draws happy characters in fun worlds doing nice things. 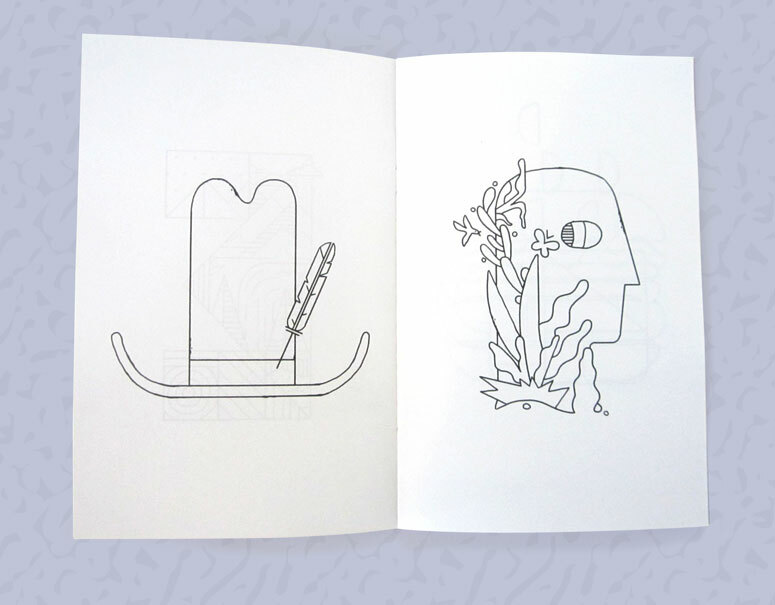 He lives in Basel, Switzerland and looks for inspiration while skateboarding. 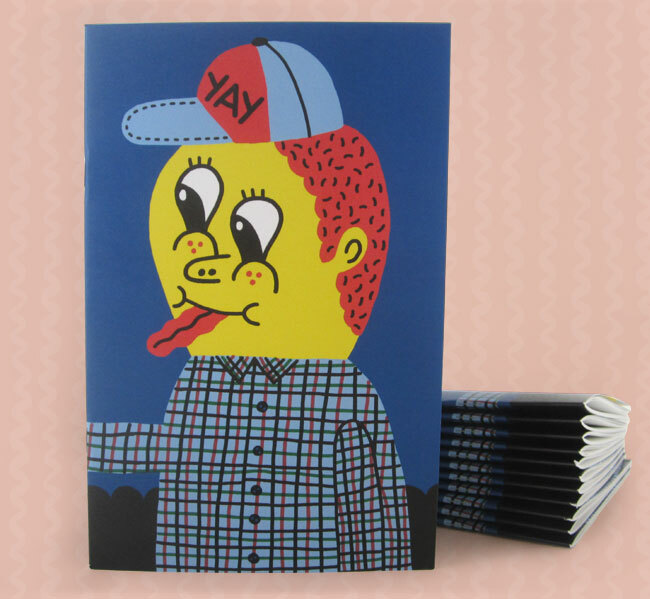 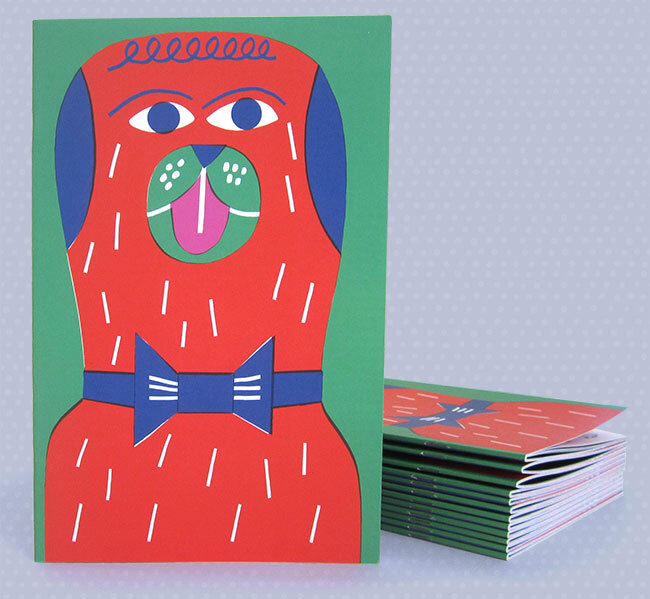 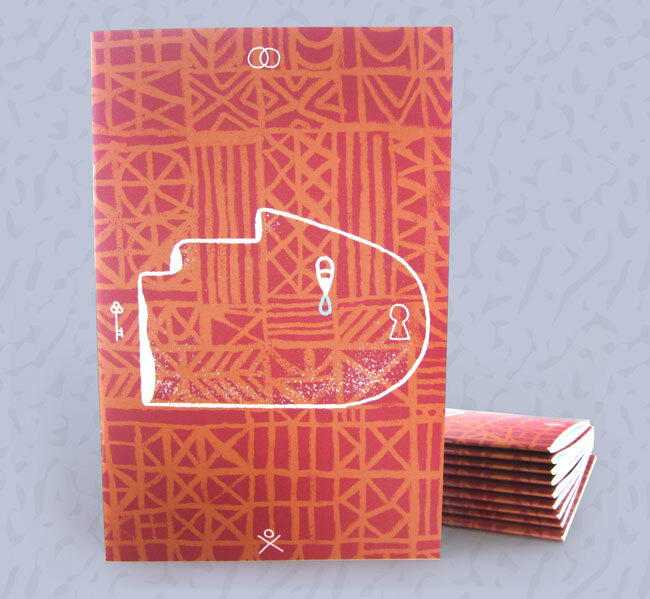 He made a really cool cover for a great book by Anorak Magazine! 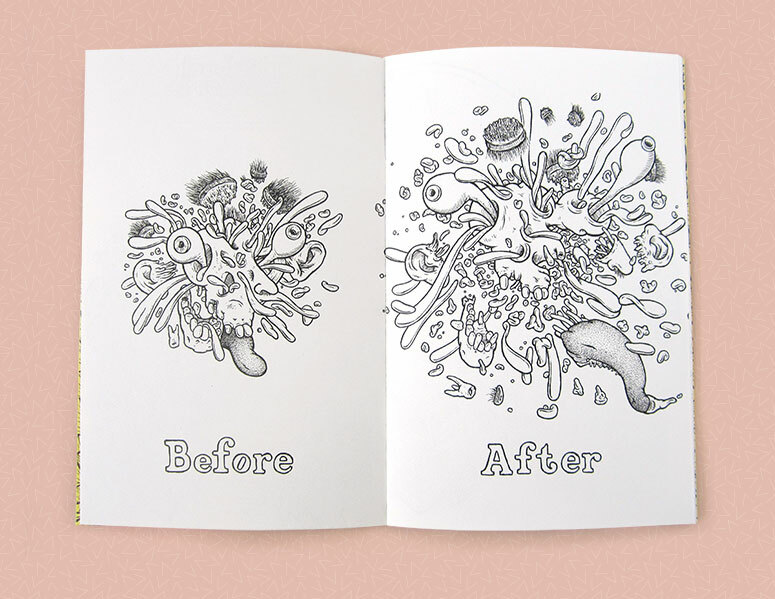 Travis is a voracious drawing dude. 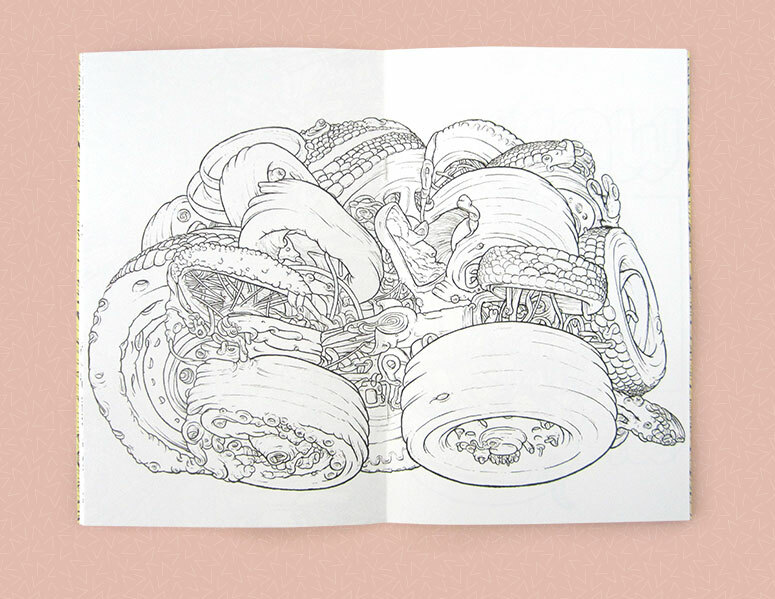 He draws with pen, pencil, and even pancake! 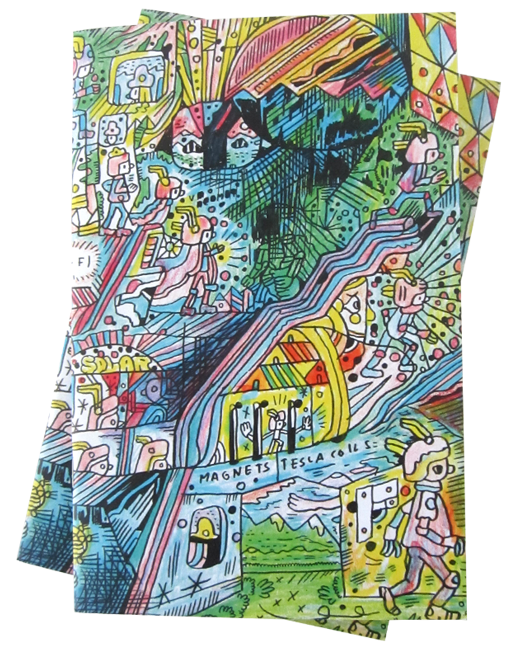 His artwork has been featured on skateboards, Dinosaur Jr and El-P record covers, books, comics, in galleries and on walls. 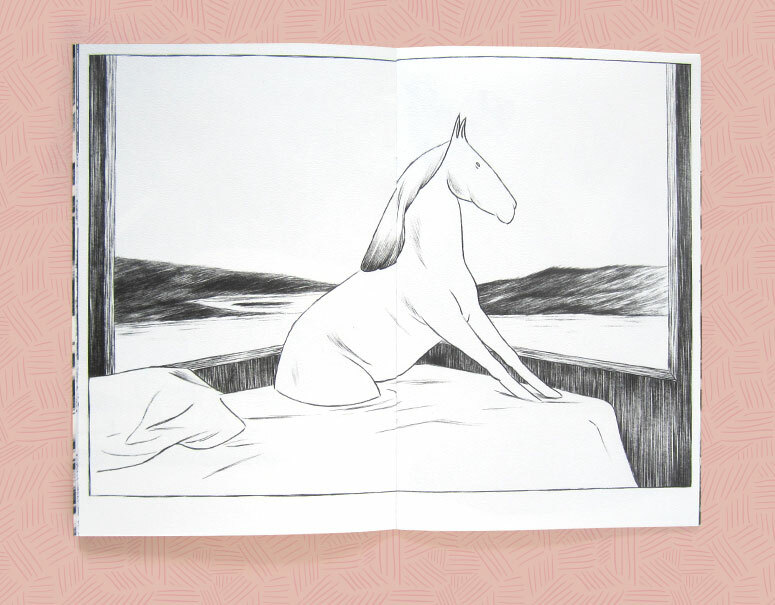 Looking at Isabel Seliger’s evocative, vast landscapes — you can’t help but imagine there is an epic, magical journey in occurring somewhere in a parallel universe. 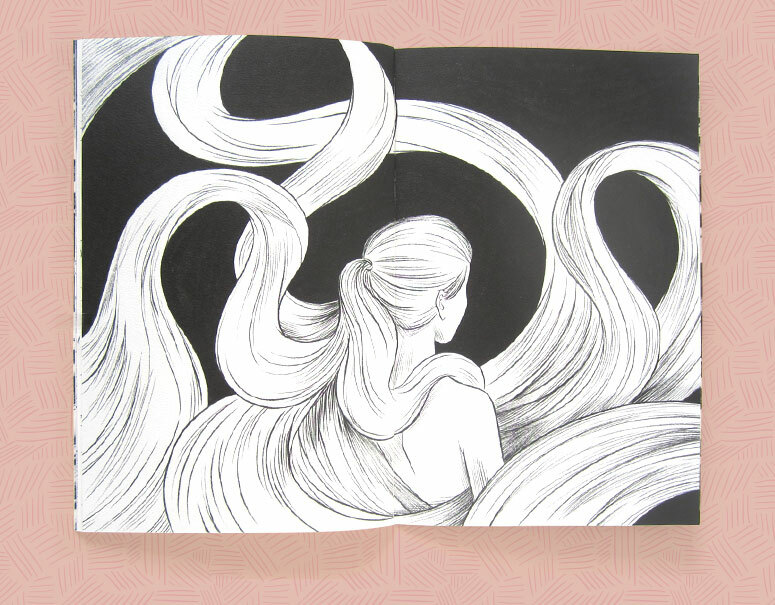 Isabel’s nimble drawings are sure to spark intrigue and wonder! 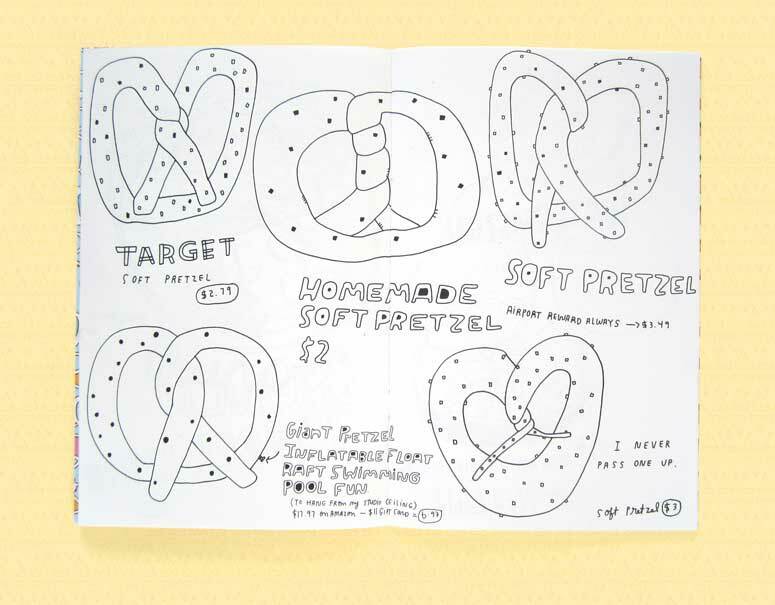 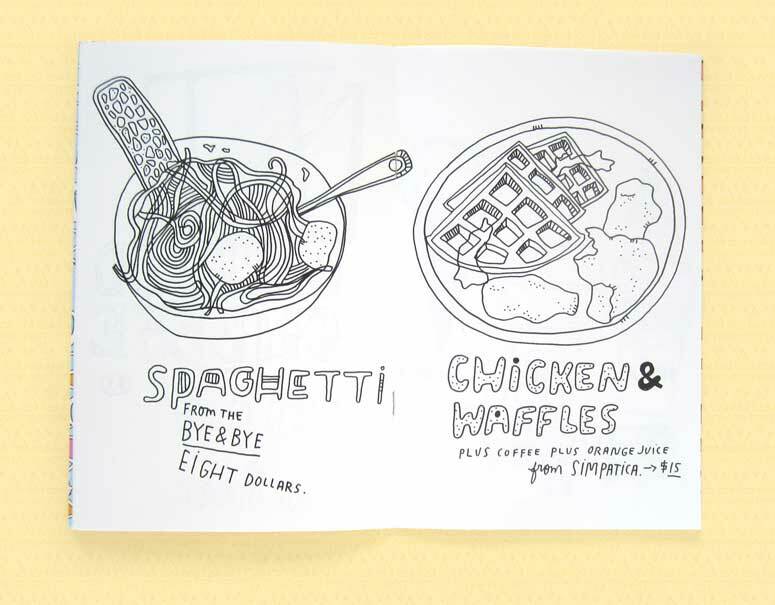 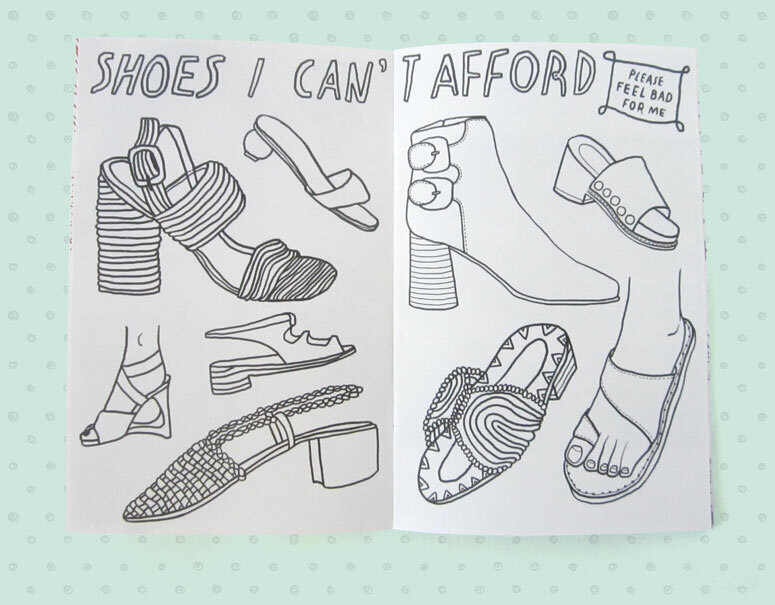 Kate Bingaman-Burt has been making drawings of stuff she buys for the last 10 years. 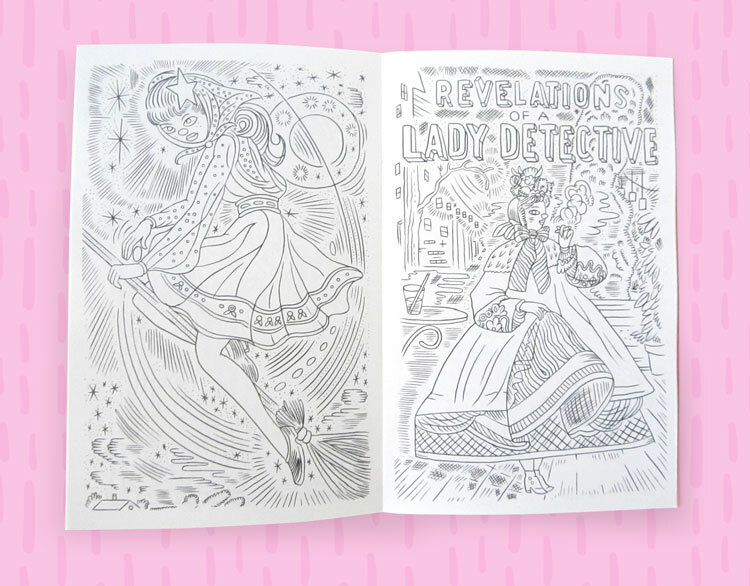 Her work is collected in several excellent books. 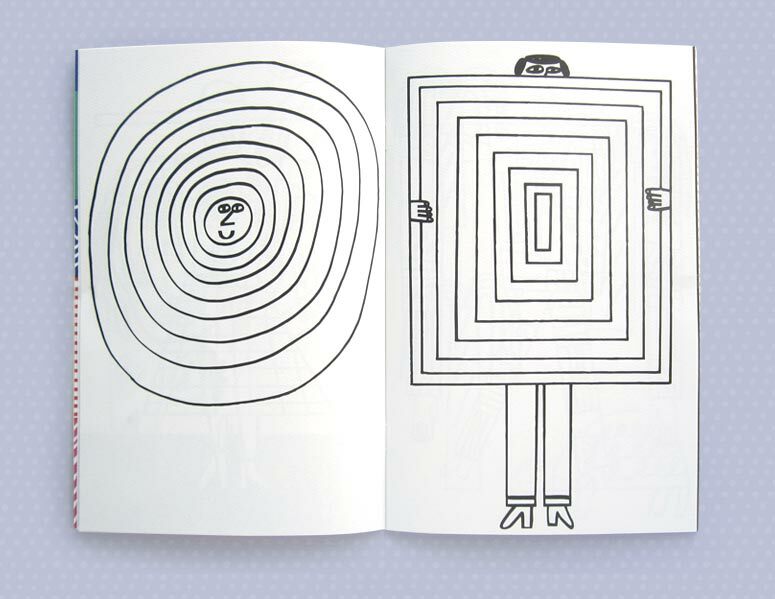 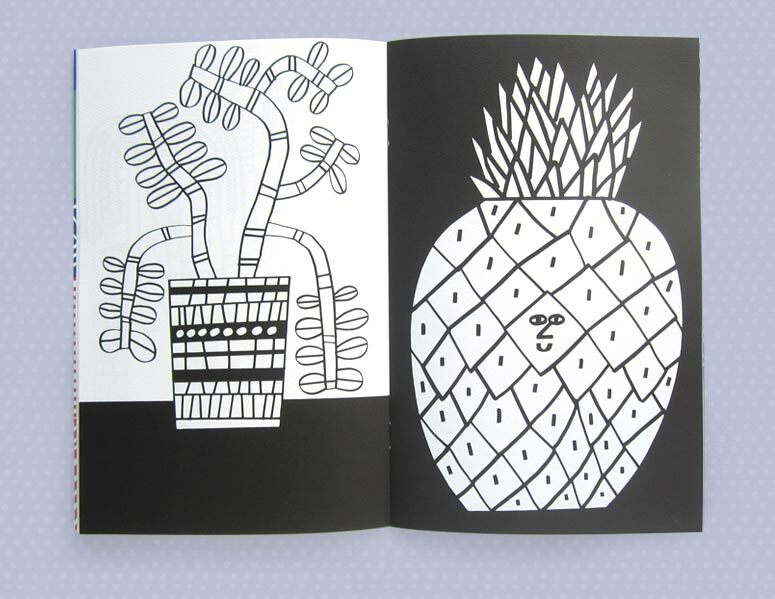 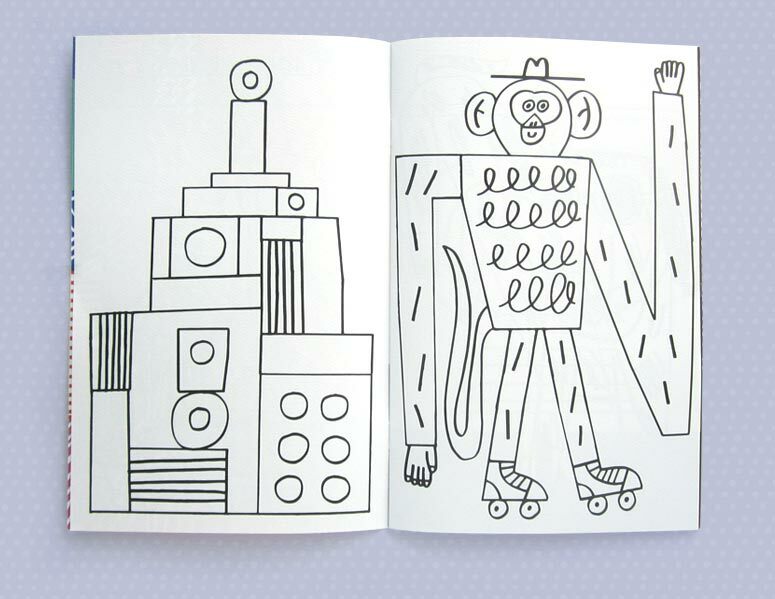 Issue 3 features lovely drawings by Marcus Oakley. 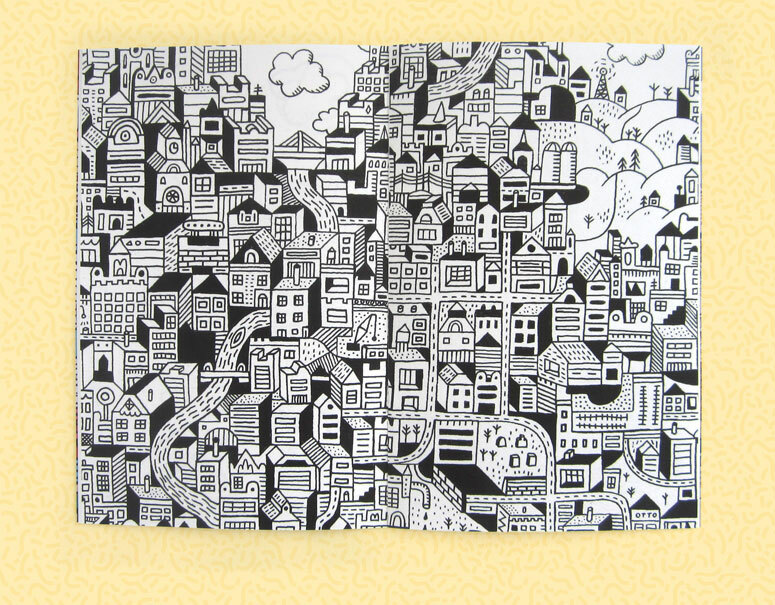 Inspired by drinking tea while listening to harmonic music, Marcus makes hopeful and honest drawings by using lines. 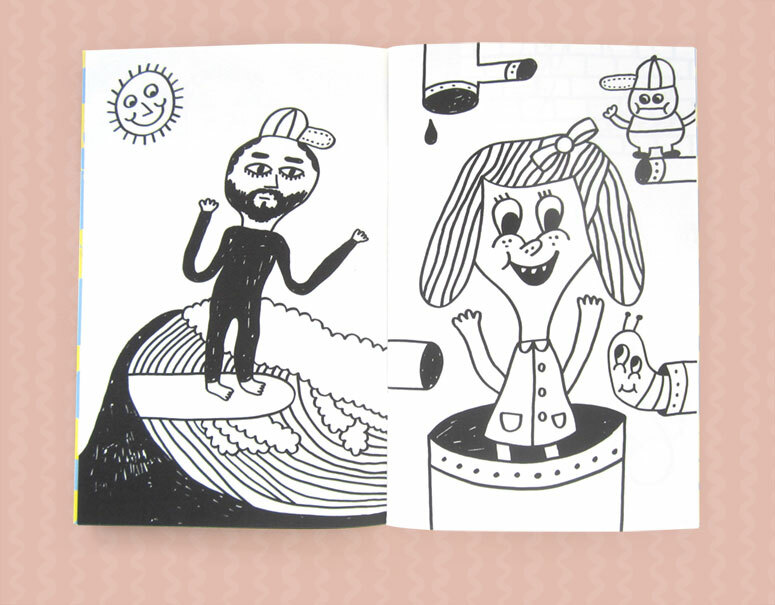 He draws a lot! 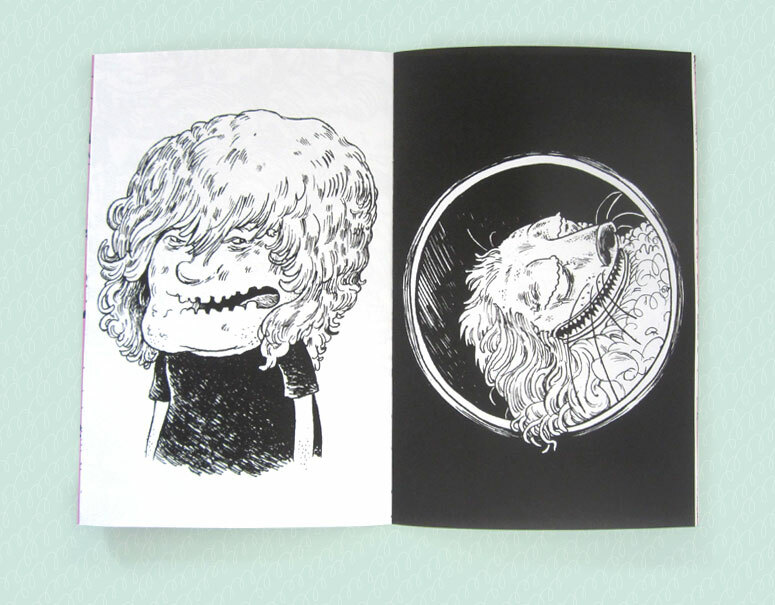 Issue 2 features artwork by Scott Teplin. 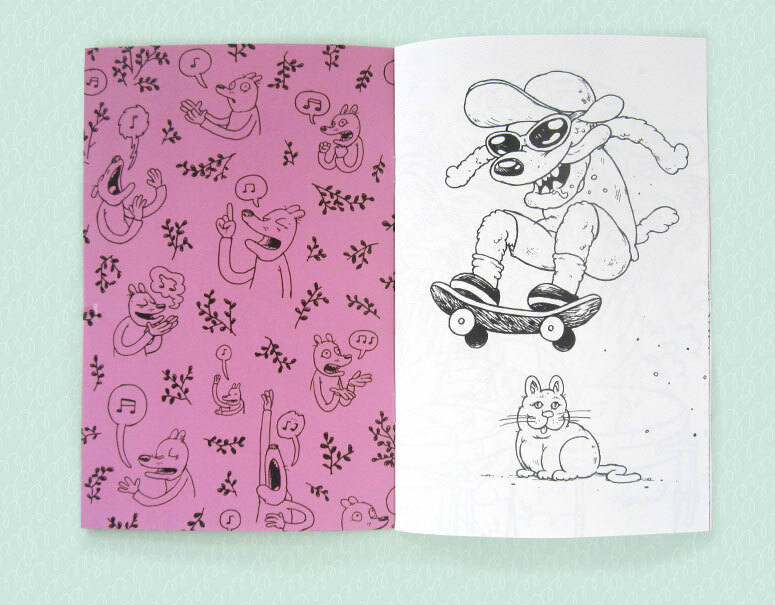 Scott’s drawings are incredibly detailed and take inspiration from his most treasured items when he was a kid: Wacky Packs and MAD magazine. 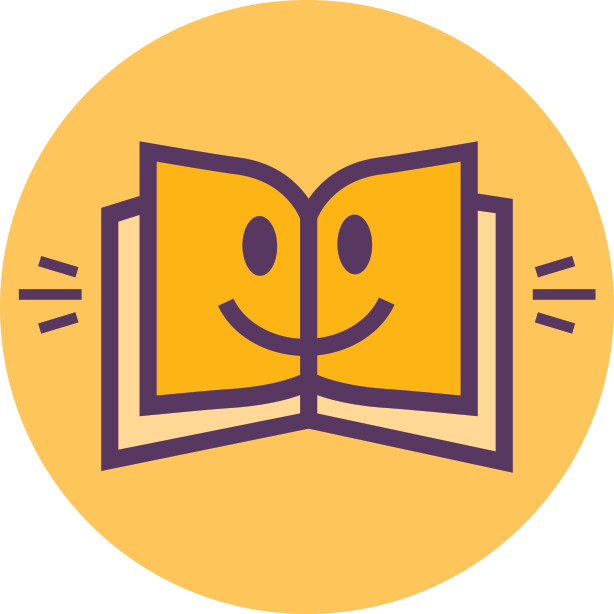 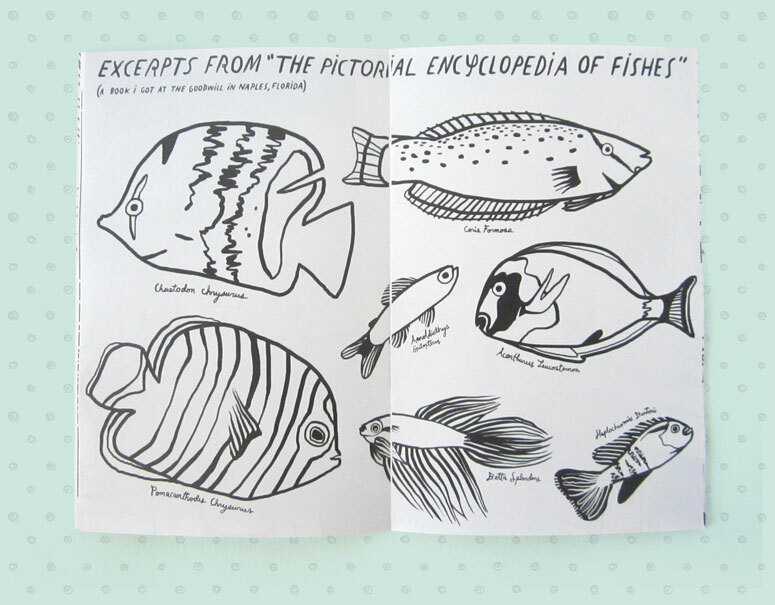 He created an amazing kid’s book for McSweeney’s. 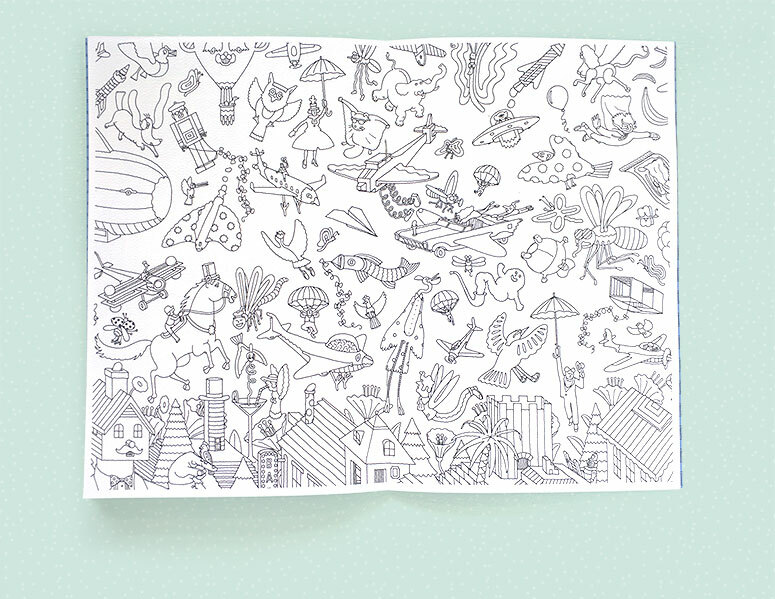  His artwork is in museums and galleries worldwide. 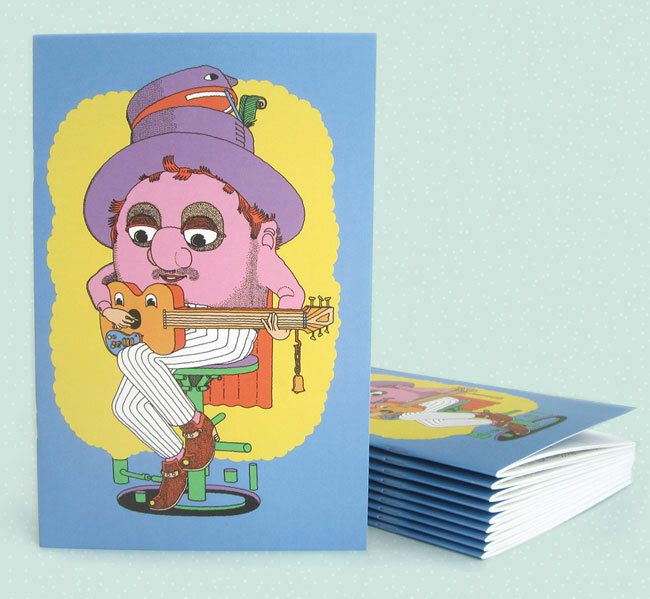 Our first issue features prolific artist, musician, creator of an excellent kid’s book, and totally nice guy Jim Stoten.